*This morning was a nice leisurely morning visiting with Kevin and Linda, and walking around the yard. Paul took Kevin and Linda to some thrift shops and neighborhood yard sales, and came home with a couple of great finds from the two yard sales. Two new projects to add succulent plants to in the yard. Stay tuned for photos of the finished project. *Paul and I headed up to Wallace to do some filming on our movie. This was Paul’s last film shoot, and I will finish up on July 14th. *When we returned home, I wanted a steak for dinner, so Paul headed to the store and bought a couple of T-Bone steaks and grilled them. I sauteed some mushrooms in butter, and also fried some zucchini in some butter with some fresh oregano. Once the steaks were done, we spread some bleu cheese spread on the steaks and covered them in the mushrooms. I made my own Italian salad dressing to go on the salad, and we had a very delicious dinner. It was a beautiful evening outside, and I spent some of it walking around the yard to get my steps in for the day. *Because of where we live, we often don’t get to experience the beautiful sunsets others people in Kellogg see. 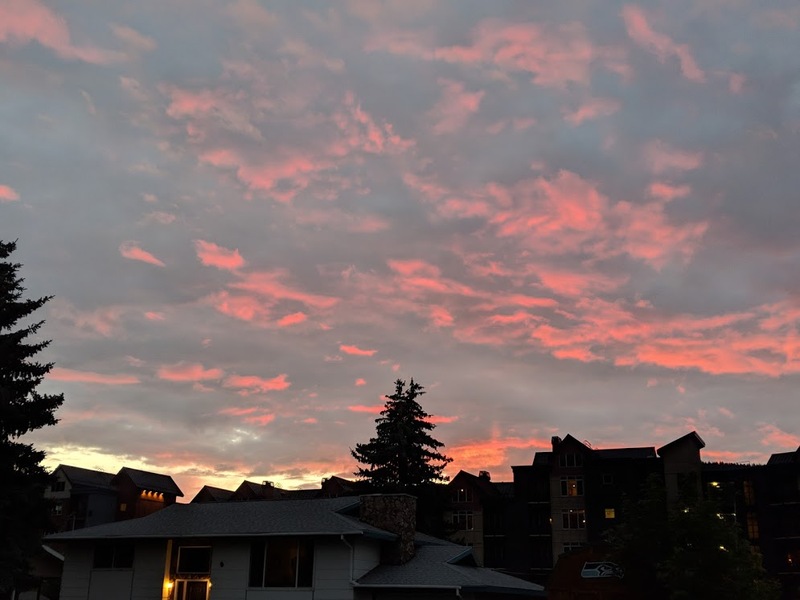 But tonight, the sky was ablaze with pinkish, orangish glow right over the condos at Silver Mountain, and I was able to see the sunset, and capture a photograph as well. A rare treat in my little corner of the world. *UPDATE ON MOSQUITO SPRAY. A few weeks ago, we made mosquito spray using blue mouthwash, Epsom salts and stale beer. We also added some No Squito Granules to some of the standing water around the yard. Maybe it worked, maybe it didn’t. Maybe the mosquitos left, maybe the spray and granules really worked. Whatever the cause, for the past week or so I have not been bothered by any mosquitoes in my backyard in the evening. So for now, I am a believer in the spray. In case you are having a mosquito problem, and want to try the spray, here is the recipe. It is a pretty cheap experiment. Regarding the “stale beer”, we opened the beer the night before and let it sit open over night. I think this decreases the amount of foam to the mixture when you stir it all together. Paul used a garden sprayer to apply it around our yard.